On our early morning tour to Uluru National Park on Sunday, I asked the driver/tour guide Phil what prompted him to come to this place. 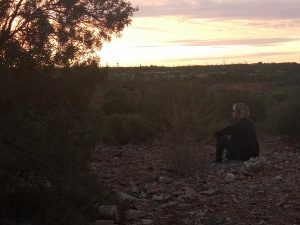 He told us he had worked on the West coast of Australia, near Perth, before making the decision to register for an online tour guiding course and then moving out to the red center with its vast open spaces and many holy sites for First Peoples. I was curious about what drives a person to make such a move. Phil, a lanky, 40-something guy with a no-nonsense demeanor and a knack for storytelling, said that he loved the land, the stories, and the vastness of the space out there. This kind of love for the wide open space and the desire to get away from the hustle and bustle of the cities seems to be a common theme in the Australian founding mythology. Coming to the outback after a 4-day visit in the big, modern city of Sydney was quite the contrast, and it gave us a bit of a glimpse of how it feels to move around in this amazing landscape. Getting away from the resort and spending the day in the outback also provided us with a sense of the awe and isolation that newcomers to the area must have felt. On that long 4WD van ride through the vast, red terrain of a cattle station, which took us to a salt lake, an 800 year-old desert oak, the ruins of a stone house built by an Irish settler in the 19th century, and, finally, to a place near Mt. Connor at sunset, I asked a similar question of Gary, our driver and guide, but this time relating to the Europeans who moved out here to settle down. I wanted to understand what drives/drove people to move out there, where loneliness, drought, sometimes flooding, and wild animals dominate everyday life. As soon as I asked the question, an answer came to me: of course it must have to do with being in charge of one’s own destiny (often an illusion, to be sure), on the heels of promises made by others – the government offered or leased land on the prairie and beyond to white Europeans who had served in World War I, for example. But Gary also emphasized the love of the vast space, which reveals more of its incredible diversity of plants and animals and rocks the longer one spends time in it. And then there is the sky that stretches on and on far into the distance in all directions. We got a glimpse of its beauty at sunset, when we stopped the vehicle, Mt. Connor in the background, and the vast bush in front of us. What struck me about those stories is that male mobility is often at the center. The women in the pioneer stories followed their men, and they ended up stuck in a home many miles away from others, like rancher Peter’s wife Dawn, who was discouraged by her husband from learning how to drive, thus ending up alone in the home for long stretches of time every day. There she was cut off from communication and encouters with others, except for their children, animals, and sometimes strangers who passed through the station and whom she insisted on offering tea and biscuits. The disconnection and loneliness they must have felt seem unfathomable today. But even today we experienced first-hand how far away destinations are and how little contact people have with others if they live out in these remote locations. After this outing to the outback, returning to yet another large urban area, the bustling city of Melbourne, was a little unsettling for me. Although I loved the narrow alleys, fantastic Asian restaurants, and the museums that had more Australian history and art on display, I found myself thinking back to the vast open spaces of the red center of the country a bit longingly.